In our ranking of the Top 25 Toughest Ironman Triathlons, all but three events can be officially completed in 17 hours. Switzerland and France adhere to a 16-hour cutoff limit; Germany (Frankfurt) recognized finishers completing the race in 15 hours. To compensate for these three races' earlier cutoff limits, we're adjusting their overall ranking by estimating average finish time results if athletes could race 17 hours. First we looked at Ironman Switzerland results, which has many similarities to Ironman Germany. Switzerland has a 16-hour cutoff, but we calculated the average finish time for a hypothetical 15-hour limit. The difference: 14 minutes. To confirm the Switzerland analysis and to estimate the difference between 16 and 17 hour cutoffs, we examined Ironman Canada results next. 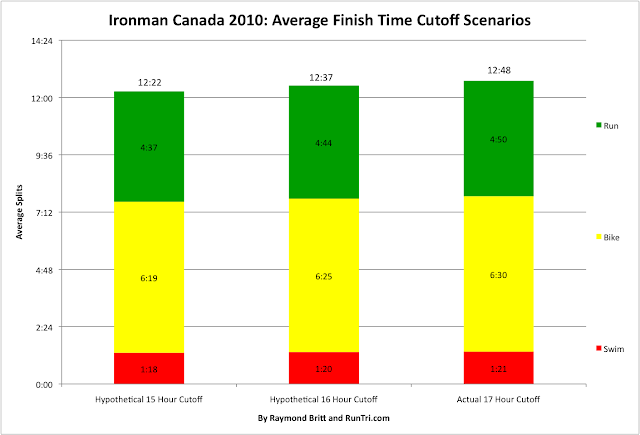 Results: the average finish time increase between a 16-hour and 17-hour cutoffs is about11 minutes. 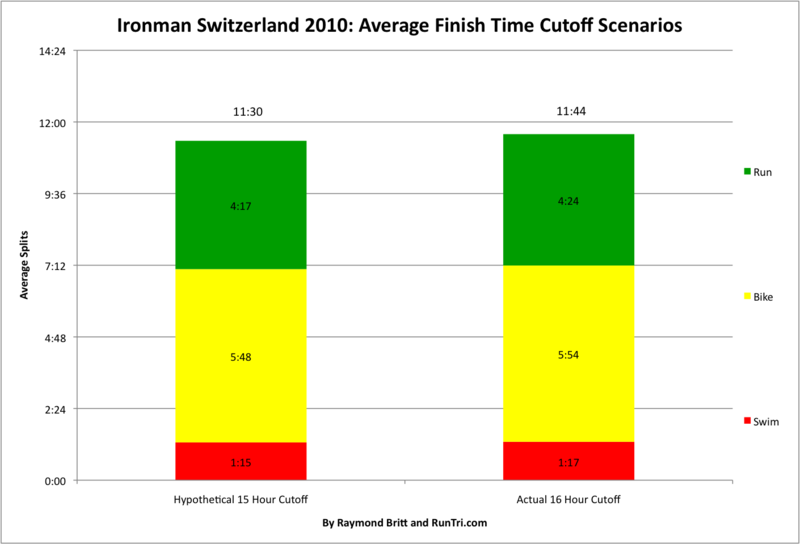 And backing into a hypothetical comparison of 15 and 16 hour limits, using actual results, we get a 15 minute difference, nearly identical to the difference in our Ironman Switzerland analysis. Based on these outcomes, to make all Ironman events comparable, we adjust 15-hour cutoff time races by adding 26 minutes to approximate a 17-hour finish time, and we adjust 16-hour cutoff time races by adding 11 minutes. Even after the adjustments, Ironman Germany and Switzerland courses remain among the fastest in our Top 25 Toughest ranking.